Before my conversion to the delights of traditional Rioja wines in addition to some more modern producers I wouldn’t have considered visiting this museum of mould. Thankfully I have seen the error of my ways! If you ever visit Rioja don’t miss this winery. We were met by the lovely Lydia who was obviously well practised in the area Of winery tours. And there must be an Iberian Blarney stone in Haro as well! The bodega looks, at first glance, as if it’s a museum and not a working winery. But the huge oak vats and old presses are still in use. And the smell! Wood, Wine and History. “Oak on a wine should be like perfume on a woman- to enhance her but not disguise her”. And speaking od oak, there’s a fair amount of it around. 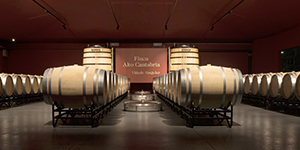 Their cavernous underground cellars hold in the region of 14,000 barrels. All these barrels are made in house by two coopers and a carpenter. A barrel a day, roughly 300 a year is the production. I had always understood that Tondonia and Bosconia were made in slightly different styles but was unaware that they are made from fruit of two distinct vineyards from which they get their name. The underground tour was fascinating. I have never seen so much mould in my life. Bottles immersed in the stuff! Incredibly atmospheric. Once we ascended the fruit of all their labour was waiting to be sampled. 4 1/2 years in Cask. So not your typical rosé! Strawberries and oak on the nose. Hint of oxidation, certainly in the house style.A wine of substance. Good. Pale yellow colour. Nice nose. Oxidative notes. Quite full in the mouth. Good. Not the greatest vintage but they have done well here. This was a serious step up in quality. Oxidative note more pronounced. There was a sweetish note on the palate. Rich mouthfeel. Very appealing. Very good. It certainly outshone the ViñaTondonia White Gran Reserva 1987 This had a more complex nose but failed to shine for me. Well dare I say it this was almost 'modern' in style! Great vintage. Nice fruit. Touch of orange at the rim- surprising for such a young wine. Great qpr. Not oxidative, nice fruit, mellow, restrained, smooth. Good. Again not a great vintage. However they have outdone the vintage. Lovely nose, some smokey notes.Velvety on palate, old oak notes but not in a musty style. Not showy, a good deal of freshness. Very good. Tempranillo (80%), Garnacha (15%), Mazuelo and GracianoMushroomy, leathery, slightly sweaty nose. Chave like. Well developed. Secondary development well underway. Rounded. Nice core of fruit to this. Really good wine. Excellent. Tempranillo (75%), Garnacha (15%), Mazuelo and Graciano. Slightly more high toned nose than the Bosconia. More classic orange peel nuance on the nose.12% alcohol.Lovely foil to the Bosconia. Excellent. I don't know if more bodegas were like LdH initially and subsequently changed their production methods or whether it was always a one-off. I'm certainly glad they have stuck to their founding principles. A true jewel in the Riojan crown. There is no greater contrast available in Rioja than that between the cellars of Lopez de Heredia and those of Remirez de Ganuza. Remember the mould? Our guide told us these tissues around the bung were to stop even drops of oxidised wine permeating the barrel. This winery was spotless.Theywere very proud that it didn't even smell of wine. It would appear that the owner Fernando Remirez de Ganuza is something of a perfectionist. I've seen hospitals a great deal less hygenic than this winery! There appears to be constant tweaking to produce the best quality product possible. If I understood correctly he was the first in Rioja (Spain?) to have a moving sorting table. When he couldn't find a suitable one he adapted a potato sorting table to fit his needs. Also he has more people selecting perfectly ripe bunches than anywhere else. They also cut the bunches only selecting the riper top half of the bunch which receives more sun. Once grapes arrive at the winery they are put in a special cold room and delivered to the sorting table at regular intervals to allow this strict selection. Only the reserva wines from the range are exported. The R. or errepunto wines are for the domestic market. These entry level wines are very good value. I wanted to visit this winery having tasted this reserva in previous vintages. I have fond memories of some mid 90's vintages. However with the 01 vintage 100% new oak is used. Deep cherry core with red robe. Floral notes and some spice. Not the rush of oak I was expecting. Nice entry and quite heavy on the palate. A wine produced by pressing the must gently overnight. A balloon is inflated with air and water to perfectly seal the tank. The resulting wine from this overnight extraction process is TRASNOCHO. Very dark black cherry colour. Mineral nose. Not the fruit of the reserva. I felt it had a touch mote noticable alcohol on the nose. Also a hint of caramel.Big wine and certainly 'modern. Drying tannins. I think this needs time to show itself. Undoubtedly this is a very quality conscious winery. I look forward to trying the wines again with some age. Nice feedback on this appealing trip. Thanks for the facts. I can not see the pictures though (maybe the pic format issue?). The 6th photo down is the Ganuza barrel room with the tissues. The sorting table photo is missing. I sent them to Paco, hopefully he can add that one. If not hopefully this link will work for you. I have already add this picture. Thanks for share your great trip with us. Good job Ray. I miss some of the nice photos and part of your trip I read at Wine-Pages. Those were appear Marqués de Riscal vs. Basilio are absolutely great. The other visits are on their way!